On April 30, 2010 I left my corporate job and decided to pursue my dream of owning a small food business : Better Butter, an all natural, reduced calorie peanut butter spread. Its been a little over 2 months since I left and we are 100% legal, operating, and selling so I’d like to share a bit about the experience of starting a food company. First, I got really lucky and found a partner who was equally passionate about healthy food and who has a great business sense and in general is brilliant. We thought we’d start small and sell at Farmers’ Markets, but upon contacting the markets we learned that we’d need to produce in a certified kitchen, be licensed by the city thus pass an inspection, and have food safety certificates and insurance. Product development was also a struggle since peanut butter is shelf stable but low acid foods like banana and pumpkin are not. Faced with the choice of adding funky things to our ingredient list we decided Better Butter would have to be a refrigerated product. 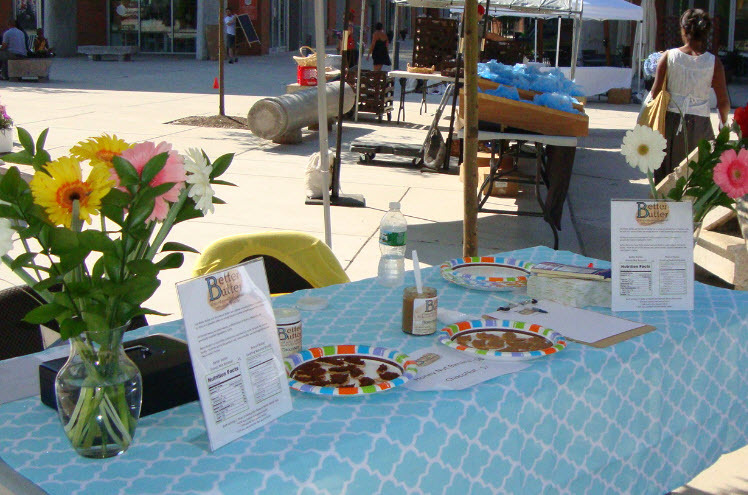 On June 18, 2010 we participated in our first farmers’ market at the Piazza in Northern Liberties. About 300 people stopped by to try a sample and we heard a lot of “mmm” “so good” and “I’ll take some”. That same day we brought a sample to a local store, Almanac (900 North 4th St), and later in the week we had our first case order! There’s many highs and lows every day as we figure out how to make our small business work but I am unbelievably thankful to have the opportunity to give this a go. Our next big challenges are to invest in equipment that allows us to somehow speed up the process and to build awareness for Better Butter and have stores sell it. If you are in the Philly area please support our small peanut butter spread business by asking your local retailer to carry Better Butter. Visit our website to see what farmers’ markets we are selling at and what stores are doing tastings and starting to sell our product. Additionally, we will list pick up points outside of farmers’ markets where you can purchase the product. For those outside of the Philly area, we will start shipping once the weather cools down so stay tuned. A final request – please be our fan on facebook!